Midnight Skate Session with Dani – super Skater, Poet, Teacher, Mom, Philosopher | Surfer Grrrls Brazil! Yesterday I hung out with my friend Dani, who is a super radical and inspirational skater, surfer, high school teacher, mom, poet, and rapper. (You can check out her poetry blog by clicking here.) Dani is getting her masters degree in philosophy, studying the relationships between human knowledge and the natural world. She also regularly blows open the minds of her high school students at the “demonstration” public school where she teaches philosophy (how cool that Brazilian high school students are learning philosophy as part of their curriculum!). I met her at a potluck dinner where, after some fun conversations about my project and Dani’s previous life adventures rapping in Sao Paulo, we decided to write some raps. When we finally met up to do some writing one afternoon on the shady lawn of the University, I felt that wonderful feeling you get when you know you’ve found a kindred spirit. Yesterday I went to her lovely house in a small town in the southern part of the island. Her husband, Zazo (also a surfer), grew up on the street where they currently live, although he told me that when he was little there was no street and the whole thing was a forest. They have two kids, Caio and Elis, who are wondrous. Elis (age 4) likes to spend her time scaling the wall of the living room, standing atop the window sill, and launching herself onto a mattress below. 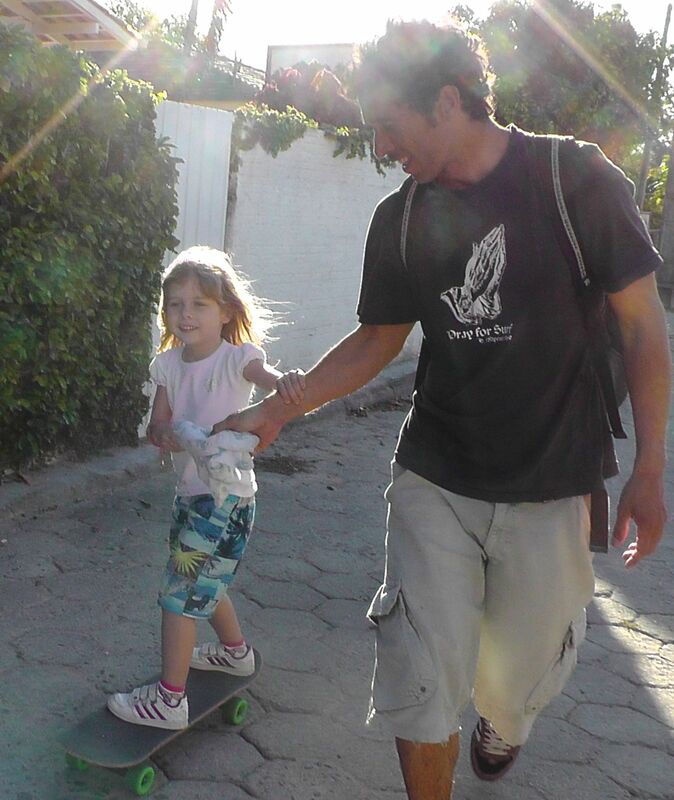 She already calls herself a surfer and when the family goes on walks, she rides a skateboard, pulled along with the help of her dad. 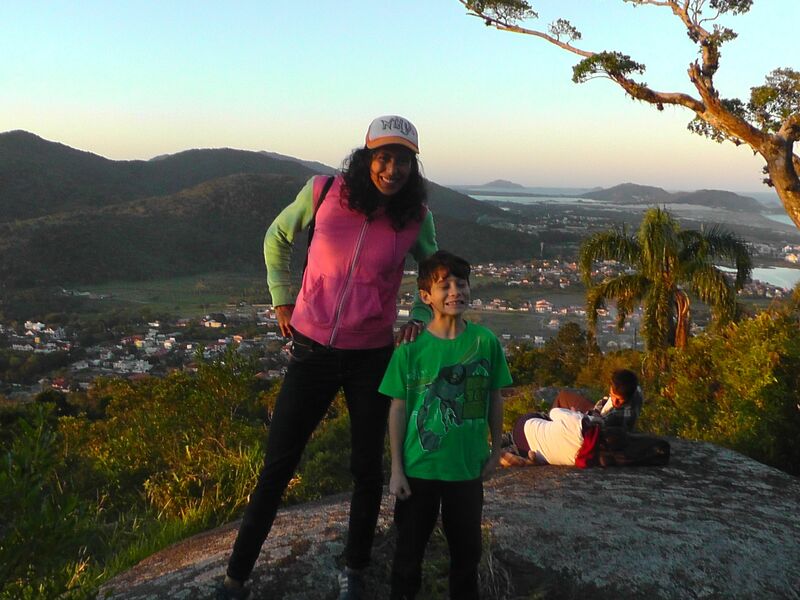 Caio, (age 10) has got the 100 mile an hour brain of a video game designer and/or backyard inventor, likes to talk like darth vader, generously shares everything he has (including chocolate, which to me is extraordinary for a 10 year old), and cares for his little sister like a second dad. After a yummy spaghetti lunch, we hiked to the top of a forested mountain from which we could see much of the southern island, including the vast sand dune ecosystem of Joaquina. And after the kids went to sleep, Dani, Zazo, and I took out skateboards and went “street surfing” down one of the best skating streets on the island Rua Pau de Canela, perfectly smooth, very long, and downhill all the way. Dani who is an ex-competitive skater had some sick moves. I was just stoked to be on a board after many years of not being on a board. I scared and thrilled the bejeezus out of myself just by shooting the not so steep hill. Here’s some very dark footage of us having much fun, taken by Zazo. Thanks Dani, Zazo, Caio, and Elis for a perfect day! Mira, you are so cool bruh. It was so cool seeing you. Every time I try to do some crazy stuff on my board, I think of you dude. You’re just so epic keep it up.